The audience was immediately on their feet. How could they not be? I mean, this was Stan “The Man” Lee. As I sat in the art auction, I thought about all the amazing things Uncle Stan had done for comics and how many great stories he must have about his experiences. With the Spider-Man movie out and Comic-Con wrapped up, I thought it would be fun to talk about the time that Stan Lee (and Marvel) challenged the Comics Code Authority and won. Stan had also been there when the Comics Magazine Association of America (CMAA) was formed in September 1954. The CMAA, under the leadership of New York Magistrate Charles F. Murphy created the Comics Code Authority (CCA), a self-policing code of ethics and standards for the comic book industry. The CCA responded to the public outcry by banning graphic depictions of violence and gore in crime and horror comics, as well as the sexual innuendo of what aficionados refer to as good girl art. Although this self-regulatory body appeared to calm the growing hysteria against comics, there was a large price to pay — free speech. The Code was de facto censorship. After its enactment, the number of comics on the stands dropped from 650 to around 250, and several companies (like EC Comics, Star Press, Sterling, Toby Press, Eastern Color, and the comic book division of United Features Syndicate) were forced out of business. We did a western once. We had so many, I don’t remember which one. But at any rate, there was a panel where the hero shoots a gun and in the next panel, he knocks the gun out of the villain’s hand. And when he shot the gun, if you could visualize this, the gun is drawn in profile and, out of the nozzle of the gun, you see a puff of smoke, indicating that the shot had been fired, and a hand holding the gun — it was a close up. We sent the page to the Code and they sent it back and they said, ‘that panel had to be changed.’ And I said, ‘what on Earth is wrong with it?’ And they said ‘it’s too violent.’ And I said, ‘Why?’ Now, believe it or not they said, ‘the puff of smoke is too large.’ So, I gave it to one of the artists and he made the puff of smoke a little bit smaller. And we sent it back and they said, ‘oh, now it’s fine and they ok’ed it.” And I never knew that a large puff of smoke could be so injurious to young people when they look at it. The Marvel of the 1960s was in its own way the counterpart of the French New Wave…. 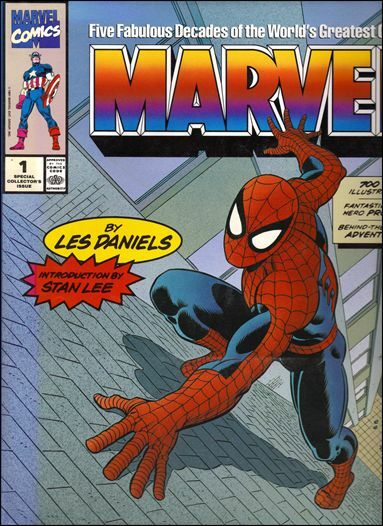 Marvel was pioneering new methods of comics storytelling and characterization, addressing more serious themes, and in the process keeping and attracting readers in their teens and beyond. Moreover, among this new generation of readers were people who wanted to write or draw comics themselves, within the new style that Marvel had pioneered, and push the creative envelope still further. Cary D. Adkinson, in his article, “The Amazing Spider-Man and the Evolution of the Comics Code: A Case Study in Cultural Criminology,” for the 2008 School of Criminal Justice, University at Albany Journal of Criminal Justice and Popular Culture 15(3), expands on the importance of Spider-Man. One such hero, introduced in 1962, helped revitalize a struggling genre and bring legitimacy to the medium itself. Peter Parker, the Amazing Spider-Man, revolutionized how superhero stories were told by confronting authority and the social ills that characterized the American cultural landscape during the Civil Rights Era. 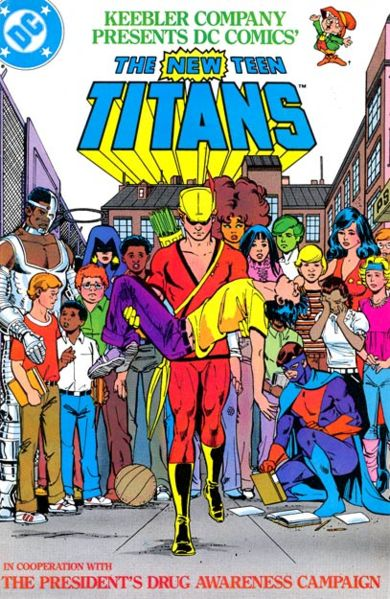 The mythos developed by co-creators Stan Lee and Steve Ditko created a universe in which “justice” depended on how characters used their power responsibly for the greater social welfare. In the mid-1960s Lee wove increasingly critical social commentary into the series, perhaps to cater to the sensibilities of the predominately college student audience, but certainly to preach the values of tolerance and responsibility to the general readership. Roy: Do you still have the letter from the Department of Health, Education, and Welfare which prompted you to write the narcotics issues of Spider-Man? Stan: There used to be a scrapbook in the office, and if it’s still around, the letter would be in there. I haven’t seen it in a million years. I got this letter — I don’t remember the exact wording — and they were concerned about drug use among kids. Since Marvel had such a great influence with young people, they thought it would be very commendable if we were to put out some sort of anti-drug message in our books. I felt that the only way to do it was to make it a part of the story, and we made that three-parter of Spider-Man. I remember it contained one scene where a kid was going to jump off a roof and thought he could fly. My problem is that I know less about drugs than any living human being! I didn’t know what kind of drug it was that would make you think you could fly! I don’t think I named anything; I just said that he had “done” something. The three-part story appeared in Amazing Spider-Man issues 96 through 98 and were drawn by the amazing Gil Kane and John Romita, Sr. 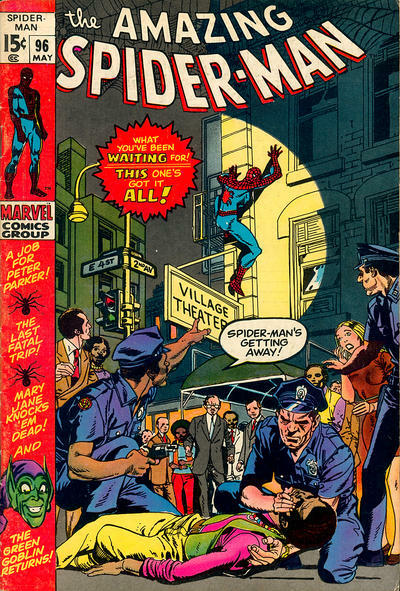 The story opens with Spider-Man saving a man who is high on drugs, dancing on a rooftop. Spidey says, “I would rather face a hundred super-villains than throw my life away on hard drugs because it is a battle you cannot win!” The main plot involving how Harry Osborn, Sr., had regained his memory and turned back into the Green Goblin. However, in an important subplot, Peter Parker is shocked to find Harry, his roommate and the son of the Green Goblin, popping pills, partly because his love interest Mary Jane Watson dumped him. Stan concludes the saga with the requisite fight between the Green Goblin and Spider-Man. However, Peter defeats the Goblin by showing him his sick son, which turns him back into Harry Osborne, Sr. I was determined not to allow the “message” part of our story to be so prominent, so blatant, as to make it seem like a sermon. I didn’t want our readers to feel we were preaching to them just because they were a captive audience — and yet, it was important that the message come across, loud and clear. The answer seemed to be to inject the theme of drug addiction as a peripheral sub-plot which would in no way dilute the action, drama, or suspense of the regular super hero theme. Second, as pointed out by Brian Cronin’s Comic Book Legends Revealed #226 on Comic Book Resources, at least one comic prior to the Spider-Man issues dealt with the topic of drugs. 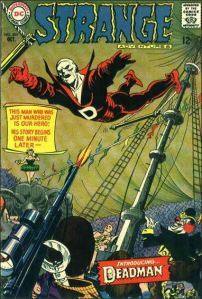 That comic was Strange Adventures #205, the first appearance of Deadman. In the story, Deadman takes on opium dealers in a book that received CCA approval and came out three years before Stan Lee submitted the Spider-Man stories. A funny thing happened there, too. The New York Times gave it a good write up. Now, as you probably know, when The New York Times has a feature story, other papers in the country pick up on it. Well, I would clippings from the other papers. But, what they would do, so often they would headline their stories something like “Marvel Comics Drug Issue Causes Controversy” and looking at the headline, you would think we were pushing drugs. So I learned there is no good you can do that doesn’t turn into something you are embarrassed by later. 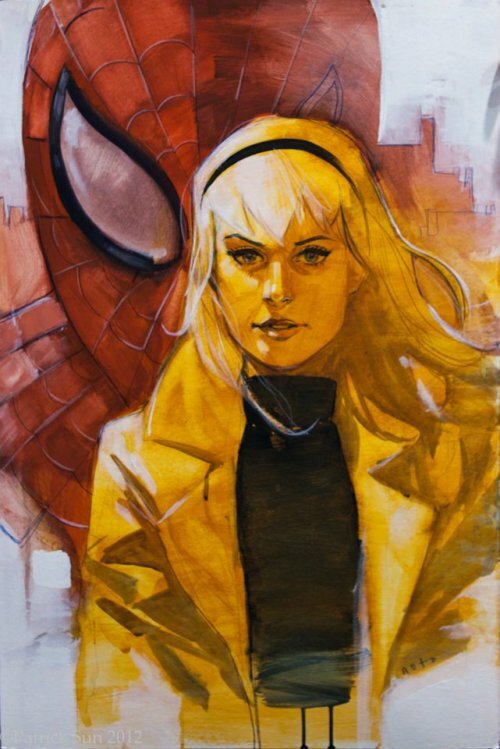 During the Stan Lee: An American Icon panel at New York ComicCon a few years ago, Marvel’s Joe Quesada, mentioned that he got into comics because his father heard about the anti-drug storyline in Amazing Spider-Man, and wanted Joe to read these issues. But all of the reaction was not positive. 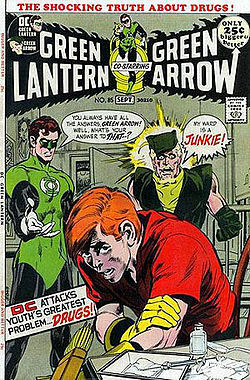 Marvel drew criticism from DC head Carmine Infantino for defying the code. DC announced that they would not do any drug stories unless the code was changed. There is a Stan Lee quote in the Ten Cent Plague, by David Hajdu, that has always struck me as odd. He says, talking about the revitalization of comics and Marvel in the 1960s, “I knew how to keep it simple. [Marvel] wanted to give kids a good time and give them something positive to enjoy. We didn’t want to change the world.” As a matter of fact, Stan Lee did change the world for the better with the anti-drug Spider-Man issues. But, if Stan had caved to the censorship of CCA, we would never have been able to read those issues. And that would have been a crime. ‘Nuff said. Joe Sergi is a life-long comics fan and author who has written short stories, novels, comics, and articles in the horror, science fiction, super hero, and young adult genres. When not writing, he works as a Senior Litigation Counsel in an unnamed US government agency. More information can be found at http://www.joesergi.net/.